Alternate Title: My one week escape from reality! UPDATE: The dates for 2016 are posted and registration is available! If you pay a deposit by Dec 31, 2015, you will get a $200 discount! Women’s camp is running June 19-24, 2016 – click here for more information and to register! I’m not going to lie. I literally just had the best week of my life. I went to camp. A real, honest-to-goodness, overnight camp. Just for women. On Maui. Can you believe it? I still can’t either. A couple months ago, a post appeared on my Facebook feed about a camp for women held by Maui Surfer Girls. Now, I already knew the company’s owner, Dustin Tester, as we went to the same high school and more recently served on the alumni board at the same time. Just knowing what a cool chick (and truly awesome surfer) she is, I emailed her as quickly as I could, hoping to ensure a spot at camp. My mini-van turned into a board-hauling, estrogen filled machine! On the first Monday of camp, I cleared the car seats and kids toys out of my minivan, replaced them with bikinis, beach chairs and lots of sunscreen and headed to my great adventure. A mere 20 minutes later, as I approached the entrance to Camp Olowalu, I saw a group of surfers already hitting the waves. “Are those my people?” I wondered. I was greeted by Lucy, the assistant camp director, who informed me that the waves are “never this good here, in our 15 summers of camp we’ve never been able to surf this wave!” So I dropped my bags in my cabin and grabbed a board to go out and meet the group of women that I would be bonding with over the next 5 days. Amazing view from camp. No wind and lots of waves (though not in this pic-too busy surfing!) during the first few days! 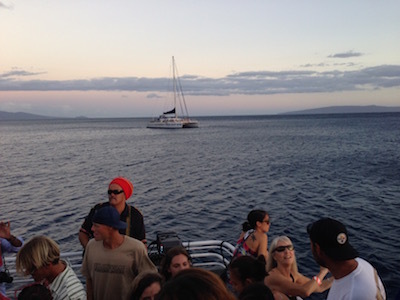 After a short session we came in to the shore to go over the schedule for the week, which included glorious things like Yoga, Massages, Snorkeling, Reggae Cruises and Bonfires (complete with s’mores)! Plus, of course, the 2 or 3 hours of surfing every morning! Then we paddled out towards the waves again and held our opening circle of camp, which was such a magical experience – so much excitement buzzing for the week ahead! I won’t bore you (or send you into a jealous rage) with a minute by minute account of what we did for the week (see schedule above! ), but I will go over the highlights of camp, for anyone considering attending in upcoming sessions. Dustin (center) with her pod of surfer girls for the first half of the week! amazing to surf right at Olowalu! Chicks with Sticks! First of all, the location of the camp is truly amazing. It is just off the highway heading out to Lahaina (across the road from Leoda’s Kitchen and Pie Shop) yet it feels worlds away from anywhere. The cabins are ‘rustic’ (if you count having locking doors and electricity with ceiling fans rustic), but they are literally on the beach and plenty roomy for the 2 or 3 women per cabin at this particular camp. The cabins were thoughtfully appointed by the staffers with Christmas lights, air mattresses (I believe an upgrade from the teen camp! ), and clothes lines between each cabin for drying towels, suits and rash guards. There are nearby bathrooms with all the modern conveniences, and there is also a full kitchen and multi-purpose room where we ate all our meals. For both the teen and women’s camp, a team of talented chefs (flown in all the way from New York!) cooked 3 healthy and amazing meals for each day, graciously working around everyone’s various dietary restrictions. And yes! There was beer and wine! This was adult camp after all! For each morning’s surf session, we headed just a bit down the road to Ukumehame Beach, where we were instructed by either Dustin or professional surfer Kelly Potts. I’d never taken a proper surf lesson before, but it was obvious that these two ladies are not just passionate about surfing, they are excellent in their teaching abilities. They are able to watch someone and tell them exactly what they need to do to take their surfing to the next level, and often on the very next wave. It was so amazing being surrounded by so many supportive, encouraging women (not just the instructors but all the other campers as well!) that hours seemed to pass by as minutes (pruny fingers and sun kissed noses were good indicators as to when it was time to head in…)! In between activities, there was plenty of down time, and the camp was fully stocked with snorkel gear, stand up paddle boards, (even a pool table!) but lounging in hammocks, reading and napping were often popular activities. The best part about adult camp is that we were all adults and all of the activities were pretty much optional, it was kind of a choose your own adventure! And as you can imagine, there was lots of laughter and fun throughout the week. just a little wet fun! Lounging, did I mention the lounging? I’m sure we all went to camp for various reasons, maybe reliving a memorable summer, or perhaps even to become a better surfer. Personally I went to camp to get out of the daily mommy-grind (I was the only one leaving two young children at home- thanks hubby for taking them!). After 7.5 years of stay-at-home/work-from-home momminess, it was time for a little R&R. The camp was so relaxing and rejuvenating, I went home feeling completely refreshed. I also want my children to know that I have hobbies besides carpool driving and dishes. And besides, daddy surfs, so why can’t I? Party aboard Pacific Whale Foundation!!! The last morning a few of us die hards woke up for a final early session before the first departures started. Once we got back to camp the packing was in full gear, and in that bittersweet moment, as we said our goodbyes, we all asked where we could put a deposit down for 2016. I’m already counting down the days. 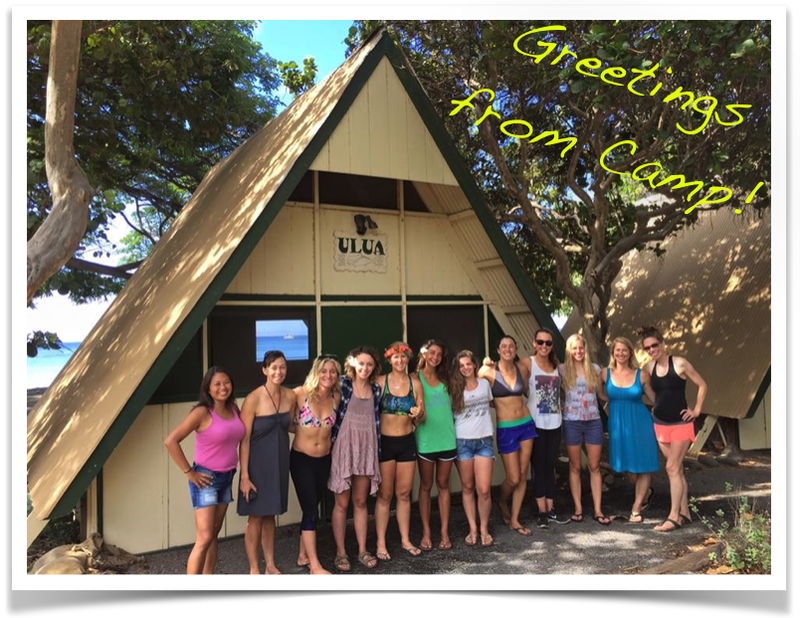 All of the lovely ladies of Maui Surfer Girls first women’s camp! 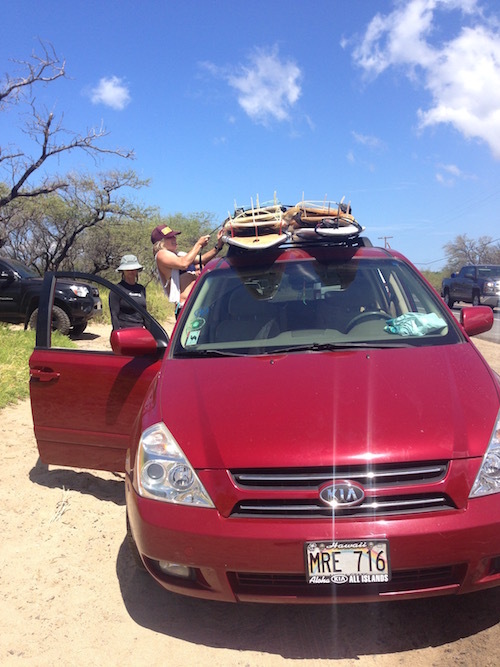 This is what packing up an entire month of surf camp looks like. A close up of some of the darling cabins! Dustin and the Maui Surfer Girls’ Mascot Luna! 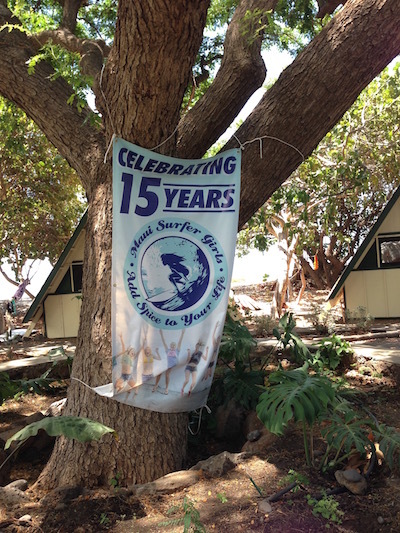 Or check out their Year-Round Surf Lessons! 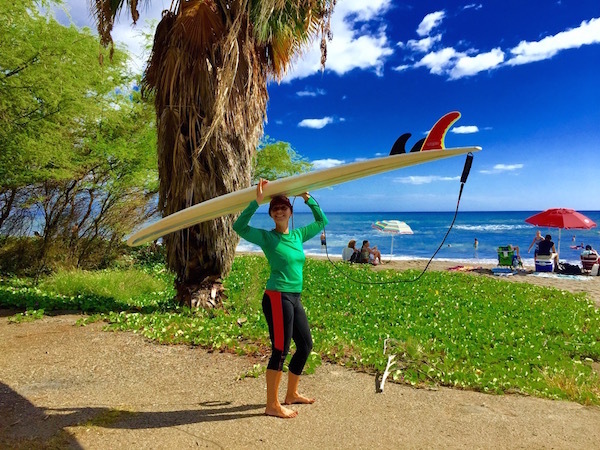 You dont have to go to camp to experience the excellent teaching of Maui Surfer Girls (and some of their awesome male instructors too!) – Lessons are open to ALL Ages and beginner to intermediate surfers. A panoramic view of the camp grounds.